During 3 days, in Bozar and at the Royal Academy, teachers, school directors, parents and students, researchers and anyone interested in teaching and digital as well as in continuing education are invited to reflect on the use digital education and teaching through digital at all levels (primary, secondary, higher and social promotion), with a significant part devoted to programming. Many practical training will also be organized. Educode 2018 will be held in Brussels Monday 27 August, Tuesday 28 and Wednesday 29 August 2018. Test KDE Edu on a live audience. Get feedback from teachers. Find out what they want. Run demos in demo area of GCompris, Marble, KAlgebra, Minuet, etc. @timotheegiet has a talk on GCompris. @timotheegiet can't make it. Unless there is nobody better, @paulb will take over the workshop. Meeting with teachers, school principal, parents an students. Recording students using software, collect feedback. The organisers have agreed to let us have a booth, run demonstrations of KDE Edu software and run workshops for teachers, students, etc. EduCode is the first edition of an annual international conference dedicated to education, practice and research in digital-related fields. It is the result of a collaboration between different key digital players in Belgium. Inform - August 27th will be devoted to the organization of exhibitions, round tables and conferences open to the general public. Training - On 28 August, workshops will be held for teachers and children to exchange ideas and demonstrate their skills. Reflect - August 29 will be devoted to organizing conferences and research presentations. Poster" format for the day of August 27th. Report of pedagogical experience conducted with a class or presentation of innovative tools. Building a resource, content or tool. The posters will respect the available format. They will describe at a minimum the context, description and contribution of the experience, tool, resource or content. Posters should be anonymized and reviewed by a member of the scientific committee. Workshop" format for the day of August 28. Report of pedagogical experience conducted with a class or presentation of innovative tools. The workshop will be presented in 45 minutes and reproduced at least twice during the day. Building a resource, content or tool. The workshop will be presented in 90 minutes and reproduced at least twice during the day. Contributions (2 pages) will follow the available format. They will describe at a minimum the context, description and contribution of the experience, tool, resource or content. Contributions must be anonymized and will be reviewed by at least two members of the Scientific Committee. Articles" format (in French or English) for the day of August 29. Contributions, in the form of a short article (up to 5 pages), will respect the available format. They must be anonymised and will be reviewed by at least three members of the Scientific Committee. On August 29, the articles will be presented in 30 minutes. The proceedings of the symposium will be freely published. I think the "Poster" submission refers to demonstrations and "Workshop"... well, is for workshops. In both cases the topic would probably be "Building a resource, content or tool", for which things like GCompris is ideal, since it allows teachers to create games for the platform. At our booth and in the demonstration it looks like we will be able to show other applications, such as KAlgebra, Kalzium, Minuet, etc. EDIT: Just realised there is an English version. I am not clever man. I still need to read the rules carefully to decide what to propose. About what you said about GCompris allowing teachers to create games for the platform, it's not so straight forward yet. Activities need to be coded, and even if it's relatively easy coding, very few teachers are up to do that. However we do plan in the future to have most activities customizable easily again, once we have the administration part done. But that is far from ready, so it's way too early to do something on this topic. So for now I think I would also aim for the workshop format on presentation of innovative tools. About what you said about GCompris allowing teachers to create games for the platform, it's not so straight forward yet. That can not be done yet without recompiling the software, and this is exactly part of the features we want to provide on the administration tool. So it is something worth mentioning but as a feature that will be available in future versions, correct? Yes it can eventually be mentioned quickly as something that is planned in the future, but better focus mostly on what is already available. Progress today: Filled in a form requesting a booth at the event. @apol and @timotheegiet: Would you like to sign up for a workshop each on KAlgebra and GCompris? The form to do so is here. Is there anybody else I should approach that may be interested? Thanks paulb for the booth request. I think doing demo on the booth is the best thing to do for GCompris. Also I see as requirement for the workshops. "Tout le matériel pédagogique fourni sera librement et immédiatement réutilisable, adaptable et redistribuable", but since we sell the full version of GCompris on proprietary operating systems, it may be a little ambiguous for this. We'll have several things we want to demo in the booth: GCompris and other KDE Edu applications. If you want, we can prepare it together and, if you can't do it, I'll do it. The opportunity is too good to let it pass. We can start now and coordinate and work out the kinks live at Akademy. But GCompris itself is available for free and under a free license for all platforms, right? As long as the application (GCompris) is free, as in freedom there is no problem. The proprietary platform is not part of the "matériel pédagogique". Ok, then I'll propose something. But GCompris itself is available for free and under a free license for all platforms, right? The code and assets are under a free license of course, but the binaries of the full version are not available for free on all platforms, as I said we sell them for proprietary systems (win/android/apple). Only the demo with 2/3 of the activities is available for free there. But sure, we can prepare something based on the activities available in the demo.. Or also show the other activities but then insist on the fact people should use GNU/Linux if they want those for free. Is the source code for all platforms available for free? By what you say, the source code and binaries for Linux are FLOSS and free as in beer, correct? Source is the same for all platforms, so yes. Correct, the installers we provide for GNU/Linux and the packages from distributions have the full version without any restriction. So all "versions" are still free software, i.e. freely distributable. You don't have anything to worry about @timotheegiet. Atelier de découverte des activités et fonctionnalités du logiciel libre GCompris. @apol, you want to do something generic about KDE Edu or KAlgebra? @timotheegiet: your talk is on the 28th at 13:30, Cyberclass 2- Looking forward to it. So now I'm sure I won't be able to attend at those dates, too bad. @paulb if you're still ready to replace me there, I would be grateful. If you confirm that I'll send a note to the organizers. I will also not be able to be at Akademy, so we need to prepare this online. I can prepare in the coming days a list of points to show and tell during the workshop. Ah! That is bad news. I think it is not a good idea to back out now. Great. I will get up to speed with GCompris. @timotheegiet: Did you manage to speak to the event organisers? I am happy to run the workshop for you. @paulb : Not yet, I was waiting a few days to see if others would be able to help. But since no one else volunteered, I'll contact them this week-end to say you will replace me to run the workshop. I'll also try to get the workshop plan and notes for you done this week-end. No problem. Things are coming together. @paulb : so as you probably saw I did contact the organizers last week-end to tell them, and forwarded to your mail. I also just finished preparing the plan text for the workshop, I sent it to you by mail too. Yes, I saw. I'll study your plan with GCompris open and get in touch if I have any questions. Thank you @timotheegiet. Editing: For those who wish, you can come Sunday 26 August between 18h and 21h to start setting up the stands. Otherwise, meet Monday August 27 at 7am (to be ready to 8h30). If you come before 8am you will have to return by the Rue des Sols. After 8am you can access at Horta Hall through the main entrance. Dismantling: Monday 27 August before 23h00. The exhibition will be held throughout the day and will be accessible to all Educode participants, as well as than to the general public. The exhibition will begin on Monday 27 August at 9 am and will end at 8.30 pm. Most Educode participants will visit the exhibition during the two coffee breaks (10h30 and 16h), lunch break (12h30 to 14h), and before the concert (18h30 to 20h30). 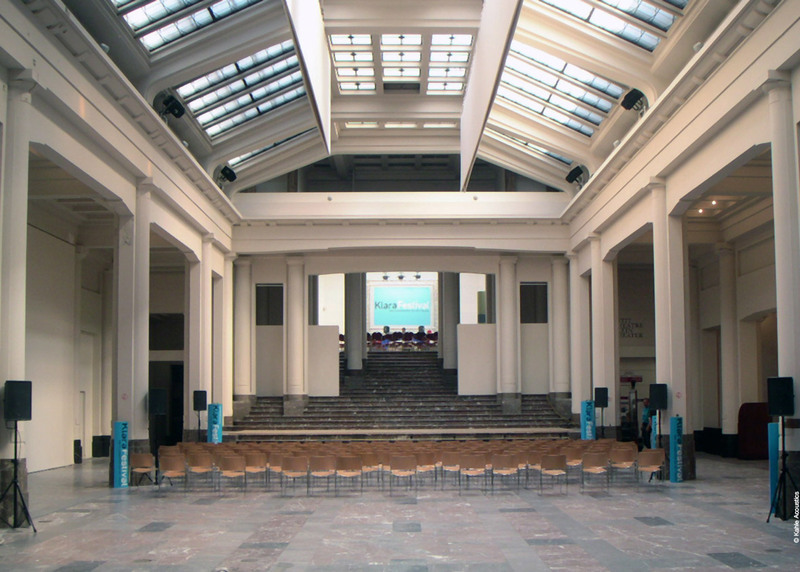 All breaks will take place in the Horta Hall. The organizers do not take any insurance relating to your goods on the stand, take care of you cover if necessary.